If you are having any of the following conditions below, unfortunately it will preclude the use of the Hair Chair for you. 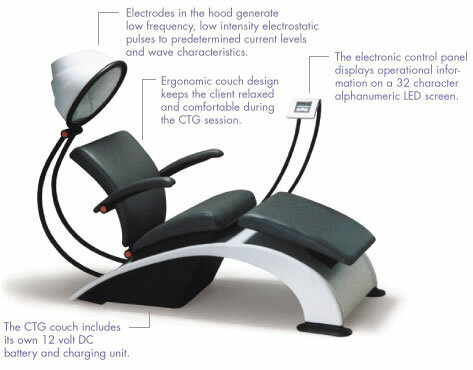 The Hair Chair, a patented technology is an approved treatment for excessive hair loss that has been available throughout the world for a number of years under the name of ETG chair (Electro TrichoGenesis) and was brought to the United States under the name of CTG chair (Cosmetic TrichoGenesis). Current Technology Corporation developed CTG chair and while TrichoGenesis is a treatment and not a cure, it alters a dormant state of hair cells by stimulating the follicles, inhibiting further excessive hair loss, and stimulating hair re-growth in suitable candidates. The technology utilizes non-invasive pulsed electrostatic energy that can noticeably create the appearance of fuller, thicker and more luxurious hair. Success rates from these treatments have been approx. 89%-96%, although results may vary, depending on the individual. Helpful for cancer patients to retain their hair during chemotherapy treatment, or to reduce the amount of hair loss (men & women). Also recommended for people suffering from alopecia (men & women), male pattern baldness, or other conditions that are conducive of hair thinning or hair loss. 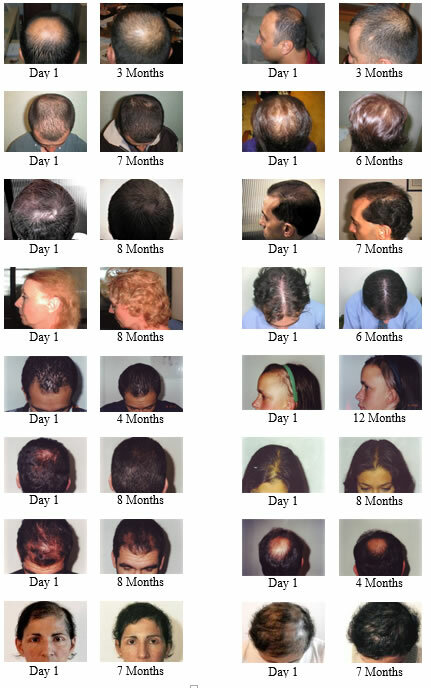 Hair Chair offers each customer a number of advantages over pharmaceuticals, topical and surgical implants. There are no side effects that are derived from the Hair Chair technology. There are potential side effects from all other remedies. Competing remedies are far more expensive. Implants are extremely expensive with most patients spending a minimum of $7,000. Pharmaceuticals must be taken for life with potential side effects. Hair Chair offers a non-toxic solution whereas other pharmaceuticals are documented as causing birth defects and other side effects. Hair Chair is convenient. It requires only one 12 minute treatment per week. While pharmaceuticals and other solution require daily doses and treatments. How the hair chair works ? Sessions are received while sitting on an ergonomically shaped couch with a semi spherical hood. This hood contains electrodes that deliver specified pulsed electrostatic energy during uniquely scheduled sessions.There is no direct contact between the hood of the device and the scalp of the patient. Energy is delivered passively to the scalp by the low-level electric field generated within the hood. This electric field is created by a low frequency, low intensity electrostatic pulse used to stimulate the scalp with very limited tissue penetration.Customers receive sessions once a week. Each session lasts 12 minutes. A fuller thicker head of hair usually observed within 12 to 24 weeks. Sessions must be continued weekly to maintain the results. The human body is truly an electrical marvel. Minute electrical currents and charges are found in all tissue at the cellular level, as well as throughout the brain and nervous system.The most basic bio-chemical functions that occur in cells are directed, in part by their electrical or ionic “charge” they are positively or negatively charged, which dictates how they behave in the body and what processes they may accomplish.In relatively recent history, this knowledge has allowed researchers and clinicians to learn more ways to apply electrical stimulation to the body to regulate modulate or modify functions, and to enhance or stop other functions. These include heart, muscle movement, soft tissue healing, bone growth healing, brain, and “pain”. This understanding of the body’s use of electricity, electrical signals, and pathways has allowed science to show us many ways to achieve desired results when trying to aid and heal debilitating human physical conditions. During the 1940’s and 50’s research began to show the way in which electricity affects the heart and its rhythms. By the 1960’s, physicians were beginning to routinely use special forms of electrical stimulation, internally and externally, to regulate heartbeats in patients whose own electrical signals were failing or compromised, and to “restart” the hearts of patients that may have stopped beating entirely. Since that time a huge multi-billion dollar market in cardiac technology has arisen from the advancement of these treatments.Another billion-dollar market began to develop during the 1960’s and 70’s utilizing internal and external electrical stimulation of the spinal cord and peripheral nerves for neuropathy and pain control. Neurosurgeons and Orthopedists realized that nerves in the body were a “two way street”. The same nerves that could carry an electrical signal from the brain to a muscle that would tell it to contract could often “feedback” a return signal to the brain that might say, “it hurts”.Both acute and chronic pain signals can often be blocked or scrambled from reaching the brain by the use of electrical stimulation in a “field” around or across the nerve, or by sometimes applying a minute current directly to the surface of the nerve. These discoveries led to yet newer devices; i.e. transcutaneous (across the skin surface) nerve stimulators commonly referred to as TENS devices. The non-invasive nature and simplicity of use of TENS devices led to rapid and widespread usage for pain control. Approximately 20 years ago, several other areas for application of electrical stimulation were explored and have developed into accepted and widespread modalities. EMS (electrical muscle stimulation) is a method of applying electrical current to the skin that lies above a particular muscle group. This current is comfortable to the patient, yet can cause the muscle to contract over and over again in an exercising regimen designed by the frequency and intensity settings of the stimulator. Thus a patient with a cast on their leg for a 10 week period can keep the muscles “toned” through “electrically stimulated” exercise and require far less rehabilitation for disuse atrophy when the cast is removed. This modality has been approved for consumer use without a prescription, and we now see “infomercials” on television that sell similar devices as an aid for facial and general body muscle toning.Orthopedic physicians have been using another form of electrical stimulation to enhance bone growth in certain symptomatic patients and others whose fractures otherwise fail to heal at all over time. This has become a routine and accepted part of orthopedic practice, and several large companies such as Orthologic and Biomet are prime marketers of electronic bone growth stimulators. Decubitus ulcer (bedsores) healing can now most effectively be accomplished by another form of electro-stimulation called PGS (pulsed galvanic stimulation). PGS’s unique electrical parameters can offer partial analgesia as well as vaso dilation (enlargement of blood vessels) that allows more oxygen rich blood to be circulated to a wound to dramatically speed the healing process.You may be aware that scientific and medical literatures, as well as television and print media, are regularly reporting on new data regarding the growing uses of electrical stimulation in the human body. For example, two new areas of research for electro-stimulation are treatments to alleviate epileptic seizures utilizing strategically placed electrodes in the brain and vagus nerve stimulation to reduce depression. Such new and surprising applications indicate the myriad possibilities of electro-stimulation yet to be discovered. Some indications will be more obvious than others. In some instances, the mechanism, or theory as to how it works will be clear and well understood. In other cases, clinicians will not be able to define exactly why a desired effect is realized when the documentation of results proves irrefutable viability. Over 50 years of research has shown approved electro-stimulation modalities to be safe, without toxic side effects. Most of this technology was met with considerable skepticism when first reported on and introduced. Now that these technologies have been proven through documented studies, they are accepted modalities of treatment that are vital and mainstream to the clinical practice of the physician. In the healthcare industry, billions are spent each year in the area of electrical stimulation.The ongoing studies by Current Technology and associated researchers are showing us that a proven new form of electrical stimulation is soon to become another simple, effective, and popular technology of great benefit when put into widespread use. The best results are achieved with clients who have just begun to notice that their hair appears to be thinning and not as full and healthy appearing as it once was. However, many people of all ages, male and female, have benefited from regular Hair sessions. Below are just a few clients of thousands around the world that are enjoying the appearance of a fuller thicker head of hair. How will I know if Hair chair’s technology will work for me? In order to ensure that Hair chair’s technology is appropriate to your specific situation, you will be ask to complete a short questionnaire. Because there are many possible reasons for the appearance of thinning hair, questions regarding your hair appearance and goals will be asked. Results of the questionnaire will be reviewed with you. If you are a suitable candidate, a schedule will be recommended and costs will be discussed. During each session, you will recline on a comfortable ergonomically designed chair with a semi-spherical hood. This hood contains electrodes that deliver specified pulsed electrostatic energy during uniquely scheduled sessions. The sessions last 12 minutes and are generally scheduled to occur once weekly. A fuller thicker head of hair usually observed within 12 to 24 weeks. Sessions must be continued weekly to maintain the results. Does Hair chair’s technology work for everyone? The best results are achieved with clients who have just begun to notice that their hair appears to be thinning and not as full and healthy appearing as it once was. Success rates from these treatments have been approx. 89%-96%, although results may vary, depending on the individual. Does Hair chair’s technology requires Nutritional Evaluation? Not at all, But by correcting your eating habits you will allow your body to work much more efficiently and as a result affects the condition of your hair.